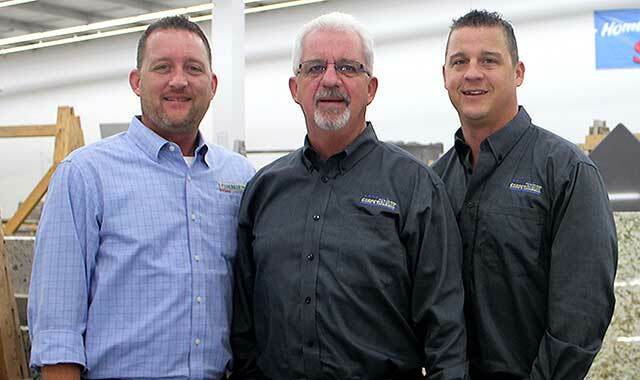 Lonnie Presson dreams of expanding his company with the help of his sons, Mark and Luke. From left: Mark Presson, Lonnie Presson, Luke Presson. Lonnie Presson has never cared about a guaranteed paycheck. The owner of Lonnie’s Stonecrafters and Lonnie’s CarpetMax has always had bigger, more creative dreams. Presson started out in the flooring business, opening his own small store in Loves Park, Ill., in 1986. Today he’s easily found at the current showroom, Lonnie’s CarpetMax, 6551 E. Riverside Blvd., in Rockford. During the years between, Presson realized the importance of adding granite into the mix of products he sells, which led him to opening Lonnie’s Stonecrafters in 2004, now located at 3291 S. Alpine Road. Presson makes the granite-buying process easy for customers by showcasing full slabs in his showroom, instead of small samples. His philosophy is to provide the best visual for customers, so they can imagine what the granite will look like in their homes. Lonnie’s Stonecrafters additionally sells quartz, a man-made stone that outsells granite on a national average. This isn’t the case for Presson, however, which he credits to the large displays of granite in his showroom. In addition to seeing the full slabs, customers can also watch up close as workers cut and polish the stone. All measurements are precise, thanks to a laser measuring system that’s integrated with a CAD (computer-assisted design) cutting machine. Not only does the diamond tooling achieve advanced results, it also significantly speeds up the cutting process, which lowers the overall cost of the granite for customers. It’s important to Presson that customers feel involved in their stone-buying experience. Keeping up with the changing technologies may seem complicated, but Presson makes it a priority to learn new equipment. He frequently meets with manufacturers to understand new products and discuss day-to-day business with others in the industry. Other components of Presson’s success involve consistently advertising in local outlets, working hard in the day-to-day grind and making wise spending decisions. This combination of factors has made Presson’s companies household names in the region. Presson advises aspiring business owners to hire employees who deliver results. Prior knowledge is not necessarily important, but personal relationships are. While Presson knows that it’s important to earn more than you spend, he also stands by using honest, hard work as the means to achieve a profit. Even in times of economic downturn, taking the low road has never been an option for him. Despite losing 40 percent of his business and having to go backwards in sales, he still managed to come out on top after the 2008 economic strife – a feat he views as “miraculous.” Commitment to customer service was the key then and now. Presson is often personally involved with customer service, and strives to fix any issues that may arise. Sterling credibility comes with company longevity, which comes from successful company branding, Presson says. Name recognition is tough to achieve, but Presson has consistently used print, radio, television and other advertising vehicles. In addition, Presson’s unwavering commitment to community involvement has played a large role in his success. Whether it’s a Little League baseball game or a golf outing, Presson’s name is on the back of shirts as a sign of support. When it comes to surviving as a business five years into the future, Presson envisions his companies growing even larger, especially with the help of his sons, Mark and Luke. Working closely with family is difficult for some people, but not Presson; he can’t imagine his business any other way. Presson also attributes much of his success to his wife, Wanda. Her support throughout the years has helped both businesses to flourish. Presson encourages business owners to always dream of becoming bigger and better. This entry was posted on Friday, October 30th, 2015 at 11:54 am	and is filed under Northwest Business Magazine. You can follow any responses to this entry through the RSS 2.0 feed. Both comments and pings are currently closed.